Our culture encourages men and women to get fit, eat healthy, and take an interest in their appearance. New technologies that can quickly provide dramatic results with little downtime are especially appealing. Men and women want to age gracefully, and look more youthful and refreshed. Men are not immune to the effects of aging, gravity, the sun, weight loss and stress. Nor are they immune to the desire to improve their appearances. Deep creases and wrinkles; a sagging, ill-defined jawline; a broken or unflattering nose; a forehead filled with unwanted furrows, line and wrinkles; eyelids that make us appear tired, and a double chin can all motivate the desire to improve appearances. 2016 statistics from the American Society of Plastic Surgeons (ASPS) show that men are having more cosmetic procedures than in the past. In fact, men represent 13% of patients who have cosmetic surgery, up 3% from 2015, and these percentages are expected to grow. 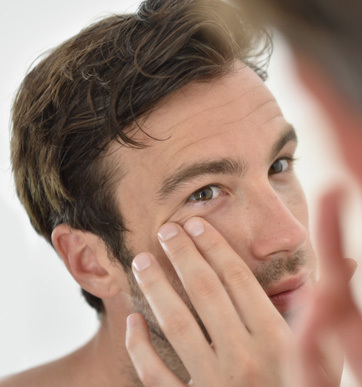 In 2017, the most popular facial plastic surgery procedures for men were: eyelid rejuvenation (blepharoplasty), neck lift (lower rhytidectomy), nose straightening (rhinoplasty), and chin augmentation (mentoplasty). Why do men seek plastic surgery? Because in our competitive world, they want to look good to stay competitive in work and in life. Studies report that improving one’s appearance improves confidence. Cosmetic Surgeon Dr. Edgar Fincher explores this topic of cosmetic procedures for men and answers your most common questions. Keep reading below for the full interview. 1. How is plastic surgery for men different than for women? Historically, men have been less likely to undergo plastic surgery compared to women. These days, however, men are becoming more interested in cosmetic surgery because of the need to remain youthful and competitive in the job marketplace and because it is generally more acceptable to have procedures that enhance one’s appearance. Most times the areas that concern men are slightly different than females. Men tend to focus on sagging neck skin, weak jaw lines or chins, excess fat in the abdomen or love handles. 2. At what age should I start thinking about plastic surgery? There is no strict age requirement for having cosmetic procedures, but the most common ages range from 40-70. Some men will undergo smaller procedures such as liposuction at a younger age if their body necessitates it. Liposuction for a heavy chin/neck, liposuction for the love handles or liposuction for gynecomastia (enlarged breast tissue) are commonly performed in younger patients. 3. What are some noninvasive procedures that can enhance my masculine features? Non-invasive radiofrequency for skin tightening is an excellent procedure for those looking to tighten facial or neck skin without surgery. These procedures are best for those who only have mild to moderate loose skin. Non-invasive fat removal (Vanquish) can also be done on patients with small amounts of excess fat. 4. What are some non invasive procedures to define my jawline? Radiofrequency skin tightening using the Pelleve device to tighten the skin along the jawline is the best method for a noninvasive treatment. Often times, this procedure can be combined with injectable fillers such as Radiesse or Restylane Lyft to sculpt the jawline and/or chin to create the masculine chiseled look that men desire. 5. What can be done about my double chin? A “Double Chin” can be a combination of excess fat, loose skin or loose muscle. Depending upon the patient, this can be addressed with liposuction alone or combined with a Neck Lift. Incisions from a Neck Lift are hidden behind the ear to make them essentially invisible. 6. How can I improve my sagging neck? Are there non-surgical options? Is it true that a neck lift can take 10-15 years off my age? A neck lift can take 10-15 years off of someone’s appearances. Neck lifts provide the best outcome with the most improvement. Short of a surgical lift, radiofrequency tightening can provide a nice result when used on the appropriate patient. 7. I have a weak chin, what can I do about it? Augmenting the chin with fillers such as Radiesse or surgically placing a chin implant are both options for creating a stronger, more chiseled chin. 8. I’m concerned about recovery time. What can I expect? When can I shave? When can I get back to my workouts? After a surgical neck lift most men can begin shaving the next day, however the patient must be careful to avoid any sutured areas for the first week. Most all of the sutures are placed outside of the beard area and are hidden in natural creases so it is not usually a problem. A patient would have to restrict and modify his usual workout schedule for 3-4 weeks after surgery. 9. What are the most popular procedures that can be career savers? Any of the procedures discussed above can deliver the desired results and be career savers. What is important is selecting the proper treatment for the expected outcome., tha is, picking the correct procedure for the individual.